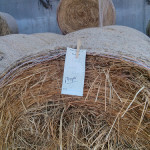 The last time we bought hay I bought one lot of winter rye baleage on a whim. 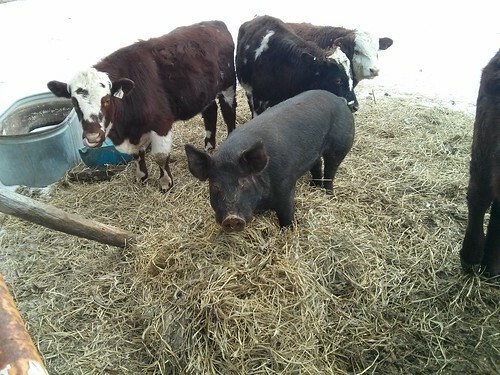 Turns out that the cows (and pigs) really like the stuff. 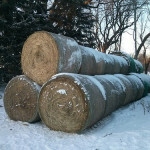 Harry, the sows and cows all make short work of the flake or two of baleage I throw them every morning, in spite of the entire bale of good grass/alfalfa hay they have available to them. 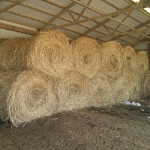 Baleage is supposed to be better, nutritionally speaking, than hay so I’ve been interested in adding baleage now that we have feeder calves. I was interested in backwards-engineering this baleage so I can get some idea of how it’s put up. 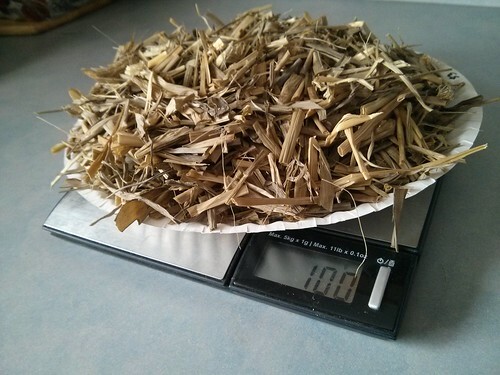 With any forage, moisture content is pretty important, so why not start by testing it? Having located the forage I wanted to sample, I pulled a fistful of winter rye out of the middle of a flake. Then go ahead and “borrow” your wife’s best kitchen shears, her food scale and a couple other doohickeys. 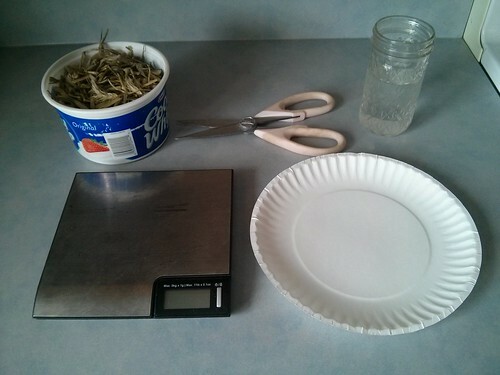 Chop up precisely 100 grams of the forage in question, depositing it all on a paper plate. Make sure you tare-out the paper plate. Those things weigh about 7 grams, and that would throw off the accuracy. 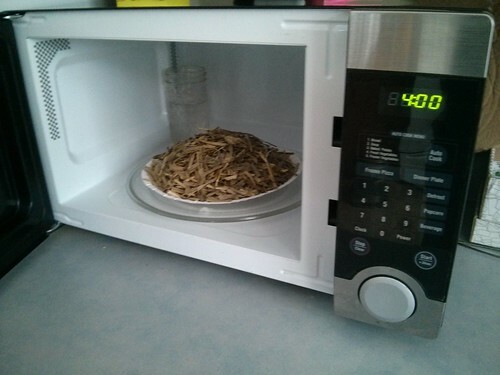 Throw that 100g of goodness in the microwave (or science oven) and make sure to put your little cup of water in there to keep things from getting all ignite-y. Also, it gives the whole kitchen that nice steamed-silage smell that your wife will love you for. 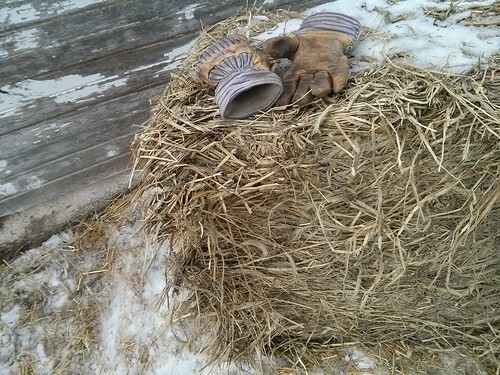 Go ahead and nuke your hay for a little bit. How long depends on the moisture you expect it’ll contain. If in doubt, it’s better to go a little shorter on the time, you can always zap it a bit more later. 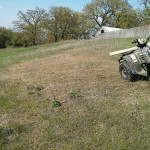 After it’s done with the first round, take the forage out, mix it up, weigh it and put it back in. Continue mirowaving the sample for 1 minute intervals, mixing and weighing between. Record your weights, you’re done nuking when the weight doesn’t change more than 1 gram. 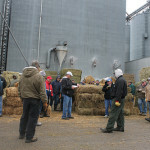 Your final weight will be the % Dry Matter of the forage. If your 100 gram sample is now 60 grams, then the missing 40% is water. 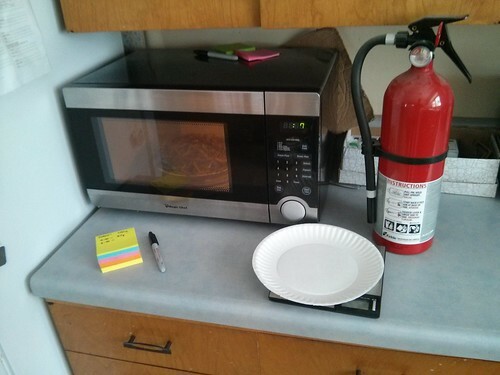 I’m curious about the jar of water in the microwave. Do you get a different moisture content if you put the plate in the oven at a low temp, maybe 215 °F? It seems like having extra water in the microwave would keep the atmosphere saturated with steam and might keep you from getting all the water out. I think when analytical labs measure the moisture content of biomass, they normally bake it at just above the boiling point of water to make sure they get all the moisture out, without making it ignite-y. Of course, there’s definitely a difference between ‘standard analytical method’ and ‘good enough.’ You probably don’t need the percent moisture accurate to two decimal places for this exercise.